In addition to my work in public radio, I also run a number of special projects in my personal time that combine my passion for podcasts, keeping local journalism/storytelling strong and editing literary nonfiction. Below, please find descriptions of each project and ways to get involved! I love podcasts. Love 'em. And because I work in public radio, I get asked frequently enough for road trip podcast playlist recommendations. Earlier this year, I noticed something disturbing about my responses. When I'd go to give those recommendations, the podcasts in my lineup have one thing in common: the majority are produced on the coasts. I knew there was a plethora of podcasts produced in places besides New York and Los Angeles because of the amount of locally-produced podcasts in St. Louis. 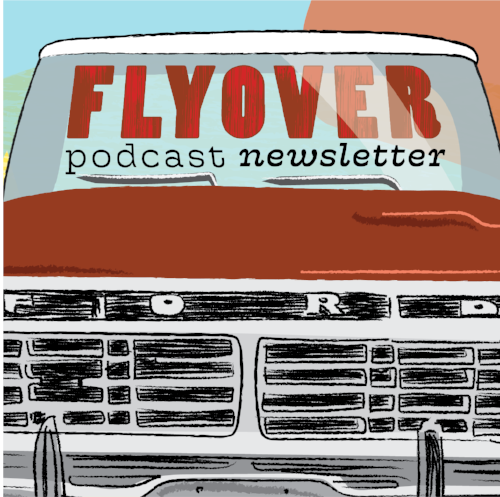 So I set out on a mission: In what I dubbed the Flyover Podcast Newsletter, I highlight podcasts large and small, independent and affiliated, but, most importantly, they're local and non-coastal. Weekly, I send out an interview with a local podcaster, episode listening recommendations, and other tidbits picked up from about the internet. Want in on the newsletter? Subscribe here at www.tinyletter.com/flyoverpodcast or check out the archive of podcasts I've highlighted so far. Last year, recognizing a void in resources for digital journalists in the St. Louis area, I founded and began co-organizing a local chapter of the Online News Association - St. Louis. Along with my co-conspirator Andrew Nguyen, a developer at the St. Louis Post-Dispatch, I organize monthly meetups for networking, training, panels and inspiration to keep local digital journalism strong. Since our first meeting in March, our group has grown to over 80 people from all walks of media (journalists, editors, technologists, developers). We've featured trainings on AR/VR and mapmaking as well as inspiration sessions on how to meet new people, food blogging, a training on Facebook Live and newsroom tours. All logistics, budgeting, outreach and speakers are organized each month by myself and Andrew. I've long held a personal love of literary non-fiction. After completing Washington University in St. Louis' Summer Writers Institute for personal narrative writing in 2015, I knew I had to keep myself embedded in that world. Luckily around that time, I met Gianna Jacobson, the publisher of the revived version of December literary magazine. The magazine was originally founded in 1958 and published the likes of such little-known writers as Raymond Carver, Ted Kooser, Joyce Carol Oates, Marge Piercy and James Wright. December is unique in that it is one of the few literary magazines to return all submissions, whether accepted or not, with extensive writer feedback and edits. I'm an Associate Editor with the magazine, reading and editing non-fiction subscriptions on a weekly basis during reading periods. Read the magazine | Submit!